Print, Capture and Share ! 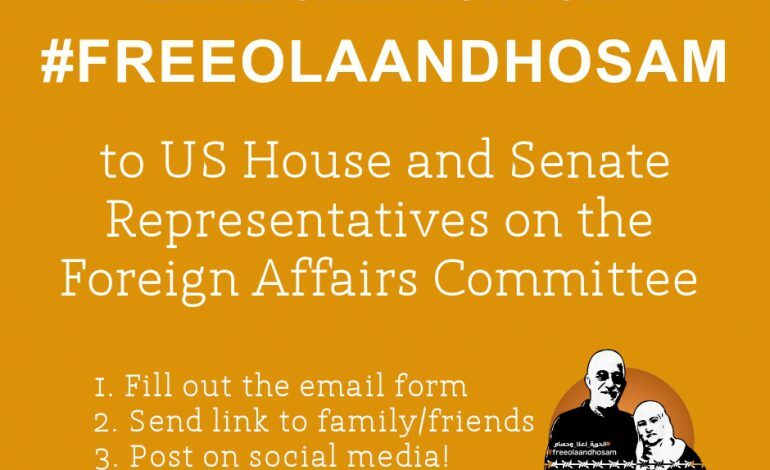 Free Ola and Hosam has launched an email campaign to US congressmen and Senators on the Foreign Affairs Committee asking the American government to step in and reunite Ola and Hosam with their children. Ola (55 years) and Hosam (58 years) have been unjustly detained in solitary confinement in Egypt for over 500 days now. Ola has become the longest female political prisoner held in solitary confinement in Egypt, as she spends 23 hours a day in a windowless cell, deprived of proper food, access to a washroom, and any communication with her family or a legal team. The verbal and physical abuse is ongoing. According to Amnesty International, her conditions amount to torture.The UN High Commissioner along with UN HRC Working Group on Arbitrary Detention have demanded for their immediate release. Help us in fighting for their freedom by signing this petition and forwarding it to all your friends and family.